Any sorcerer worth their hat can cast a few spells in the privacy of their home; what sets the pros apart is their skill on the court. 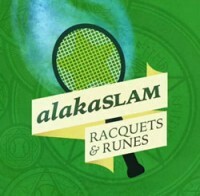 Make a name for yourself at the legendary tennis competition. ... the AlakaSLAM! The wizarding world watches from the stands as the ball hurtles towards you. Your opponent sizes you up from across the net. Time to make this shot untouchable. Slam it down the court, aim it at a crazy angle, throw an enchantment on it, do whatever it takes. Add a Review for "AlakaSLAM"